Cook the spaghetti in a large pot of water. Poach the eggs and set aside. Place salmon and spinach into a large bowl. Once the pasta is cooked lift it out of the water into the bowl stirring carefully. Add a little of the pasta water to bring it all together. 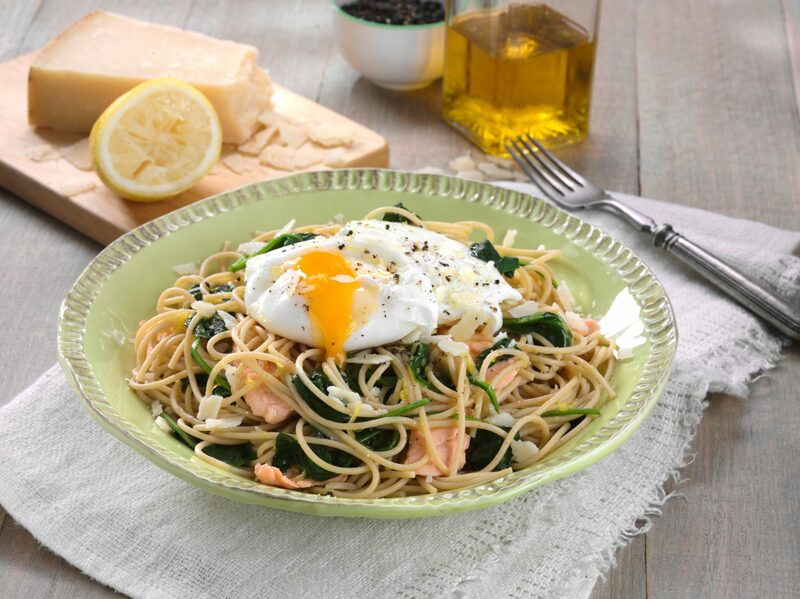 Heat from the pasta and water will cook the salmon and spinach. Combine oil, lemon zest and juice, drizzle over the pasta, season with pepper. Place onto plates and top with the poached egg and some parmesan shavings. Serve with a fresh avocado and pea salad. Tip: Salmon can be replaced with cooked chicken strips.